Like much of the south and midwest – the Ozarks are in the middle of a heat wave. In the last couple weeks we’ve had only a couple of days when the temperatures were under the century mark. I’ve run out of wildflowers to photograph – the heat has claimed them. it’s so dry that all fireworks have been banned and all of the shows have been cancelled. For a shutterbug, this is serious. No shot at those once-a-year fireworks over the water photos, no summer greenery, no roaring rivers. I still carry my camera everywhere, but I mostly get shots of thirsty deer or birds at the feeder on my porch. Last night my 99 year old neighbor, Mary Jane called. 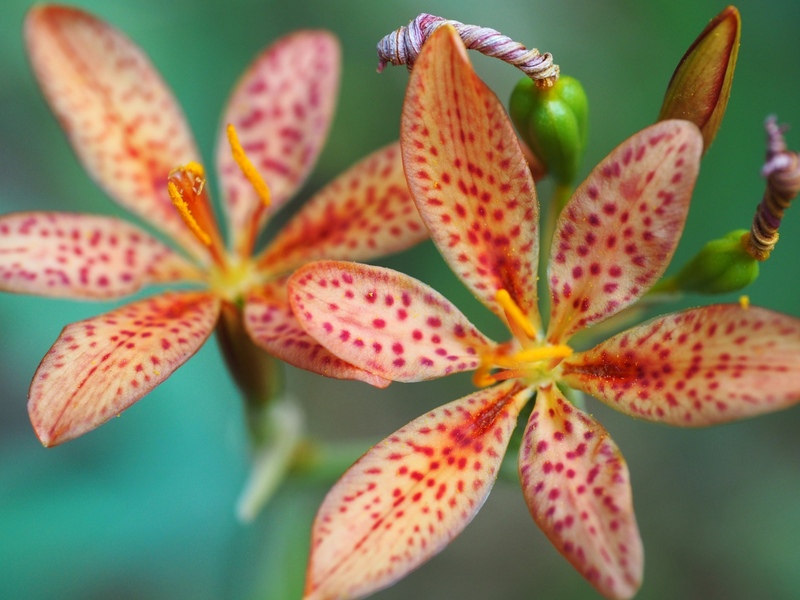 She told me that there were some blackberry lilies in the “old garden” – I should come shoot them now and when they go to seed In a couple of weeks. When I got off work I decided to head over. It was 105, but I was desperate for something colorful and alive to photograph. 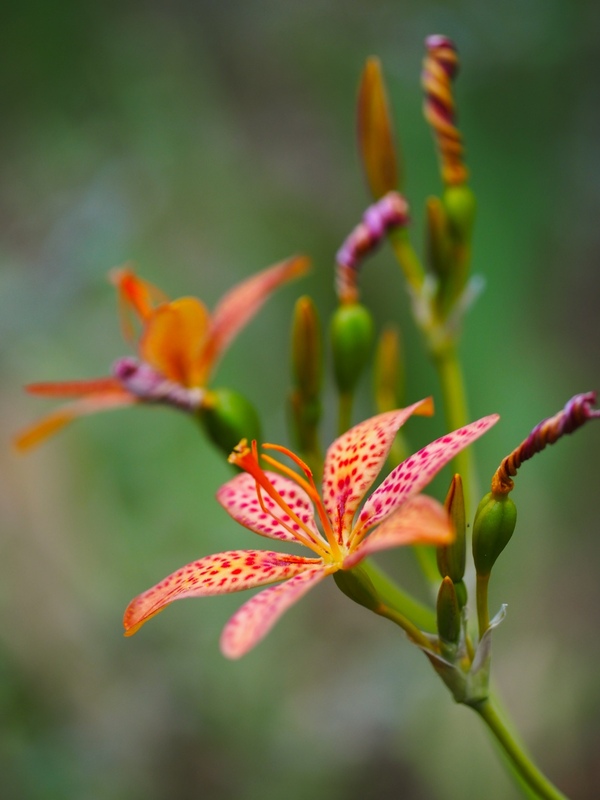 Mary Jane took me into the woods, past some old debris to a small clearing – everywhere there were these gorgeous lilies – smaller than the native tiger lilies – only about the size of a half dollar. I never knew there was an “old garden” – I learned that it was planted by Mary Jane and some young people who came to the area in the early 70s for a Folk Festival. In the years after Woodstock these kinds of events attracted young 20-somethings and when Mary Jane met them, she was happy to let them camp on her property and even live in her parent’s abandoned house. To this day these flower children are a part of her life – she cared for them as young people and now many of them return the favor. Anyway, once I got past the brush at the perimeter it’s clear that this was an amazing spot. Lilies, passion flower vines, redbuds – all following the contours of a draw as it slopes down the hill. 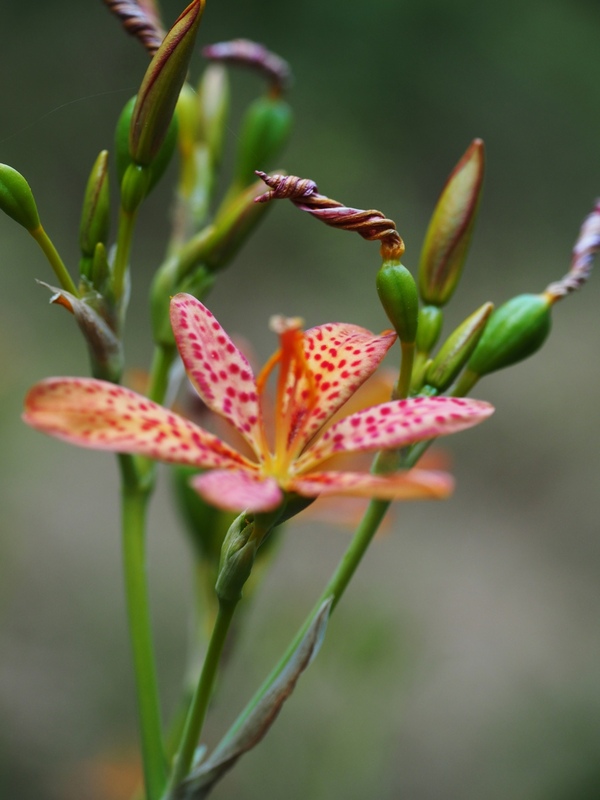 Right now the deer bed down at night in the clearing, you can see their tracks and that the brush has been compacted where they rest – but winding throughout it all are these rich and colorful lilies, growing in this shady spot. 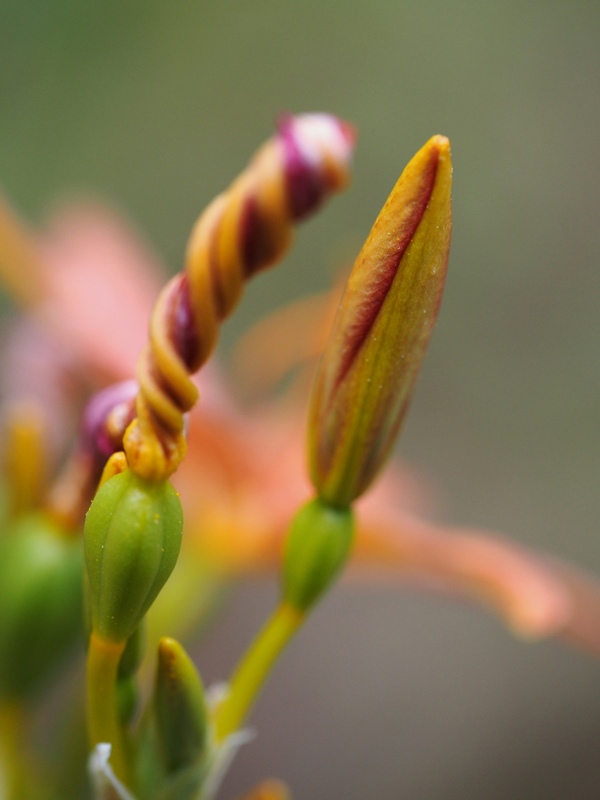 Before the lilies open their petals are twisted together in a spiral. 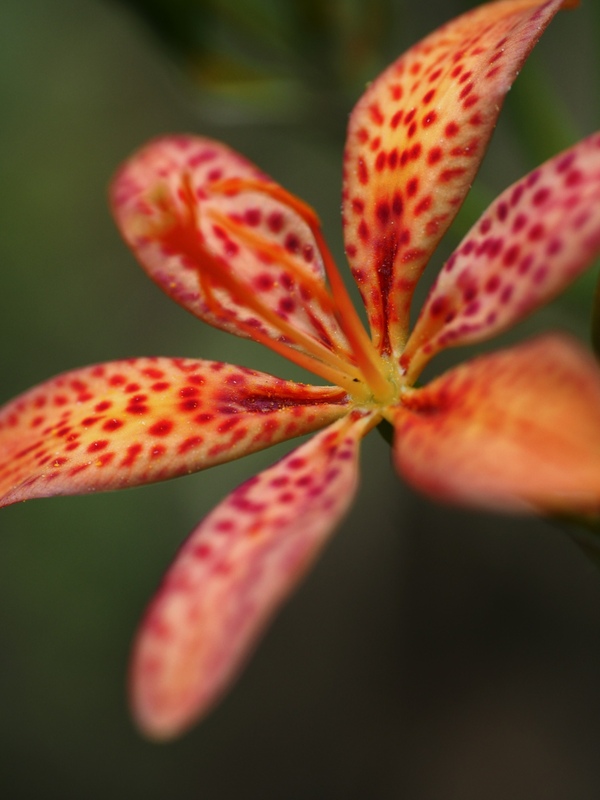 The centers of these flowers are very thin and delicate. 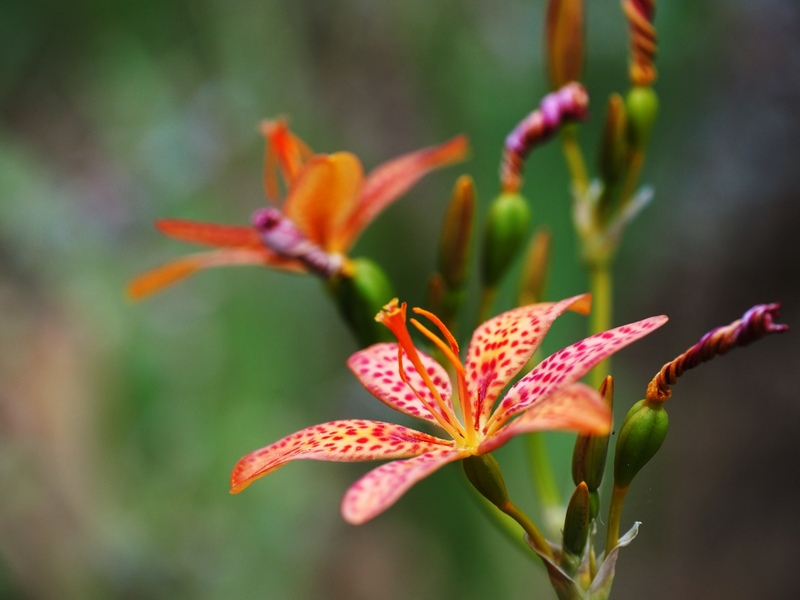 Needless to say, these small lilies were as exciting to me as a fireworks display on the 4th of July. Truly, nature is full of wonders. I had given up on finding anything beautiful to shoot and now I have the “old garden”. I think this will help me make it through the heat wave – i can only imagine it’s beauty when we finally get some rain. 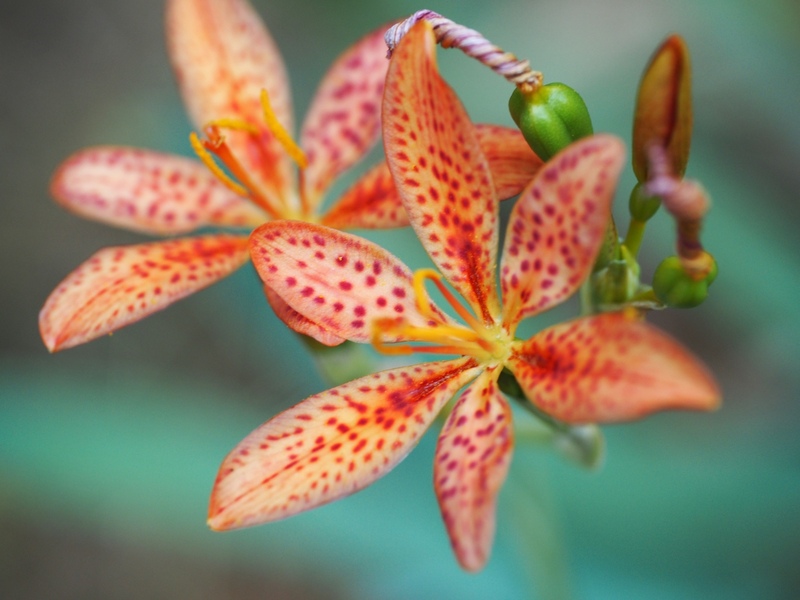 This entry was posted in Macro Photography, Ozarks, Photography, wildflowers and tagged 4th of July, Arkansas, fireworks, lilies, macro photography, Olympus E-M5, Ozarks, photography, wildflowers by artsifrtsy. Bookmark the permalink. I like it that you don’t put your name on your photos either…….Beautiful. You know, I just don’t like the look of those watermarks. I understand why people do it, I just can’t. these are great! i really like the twisty bits in the backgrounds– may fave is the third photo– great bright colors and spot on focus! Thanks! 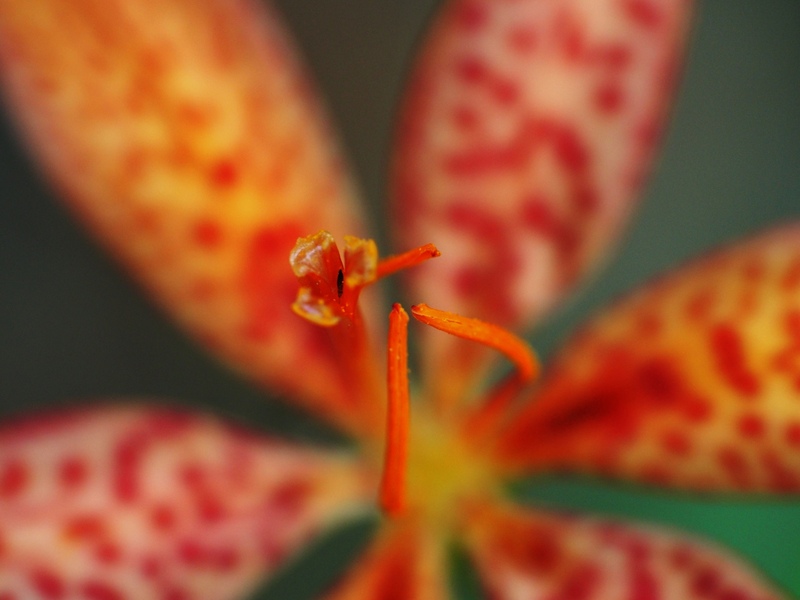 I shot these with my Leica Macro lens – it’s one of my favorites. I have never seen buds like the twisty bits before. Nature is pretty amazing. Beautiful Photos – thanks for sharing! Have a Great Day! I’m new to blogging, so I have been sifting through a gazillion photo blogs. I didn’t know there were so many. Most are like the one I started, some have good subjects, some good photos, and some good writing. Few combine two of those in one blog. Here I see great photos, an incredible subject, and interesting writing. Thank you for not doing fireworks. Thanks so much. I have been posting photos on Facebook and photo sites for some time, but always wanted to say a little more. I’m kind of new to this too and am finding my way.